Ultimate Guide to New Technology 2010 on sale today! | What Hi-Fi? Ultimate Guide to New Technology 2010 on sale today! It's jam-packed with essential reviews of the year's hottest new kit, including everything you need to know about the latest portable media players and media phones. You'll also find tests of iPod docks, internet radios, iPod-friendly hi-fi systems, music servers, media players, smart televisions, games consoles, high-definition set-top-boxes and Blu-ray disc players. Inside you'll find in-depth tests of more than 180 products, including all-new reviews of the Logitech Squeezebox Radio, Olive's stunning 4HD music server, the XiVA and RipNAS network-attached storage boxes for digital music playback, B&W's fabulous new Zeppelin Mini and much more besides. In a special feature, we tell you how to make the most of your digital kit, covering everything from making the most of your iPod Touch and iPhone to creating a wireless music system, and we've also chatted to Spotify to get their take on music listening, 2010-style. The What Hi-Fi? 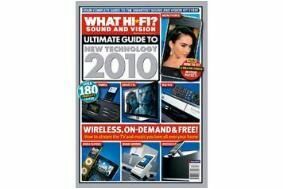 Sound and Vision Ultimate Guide to New Technology 2010 is on sale now priced £4.99 – you can find it in Asda, Sainsburys and WHSmith.